Flash news: Annual Report for the period ended 31 December 2018 is now available for download. 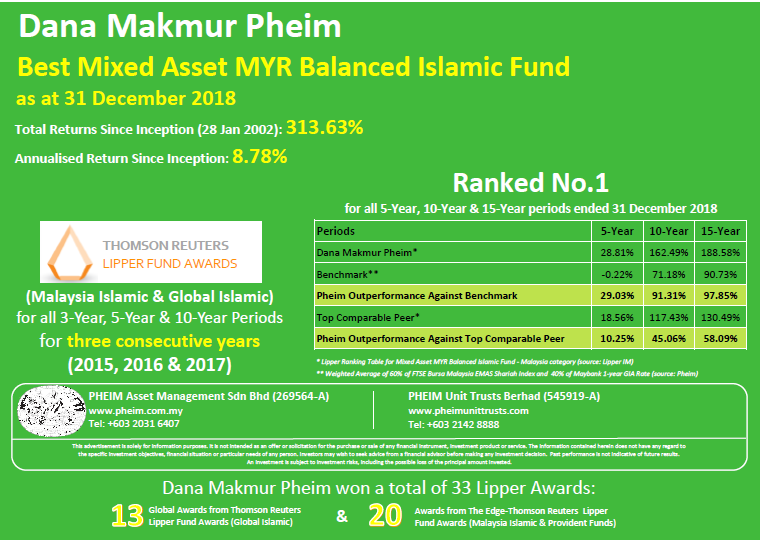 Flash news: The EPF-MIS approved funds for 2019/2020 for eligible investors are DANA MAKMUR PHEIM and PHEIM INCOME FUND. Flash news: Declaration of Income Distributions: Pheim Emerging Companies Balanced Fund (6.75 Sen), Dana Makmur Pheim (6.75 Sen) and Pheim Income Fund (6.00 Sen) on 26 April 2018 - Ex-date, Distribution & Payment date. Â© 2019. Pheim Unit Trusts Berhad. All rights reserved.